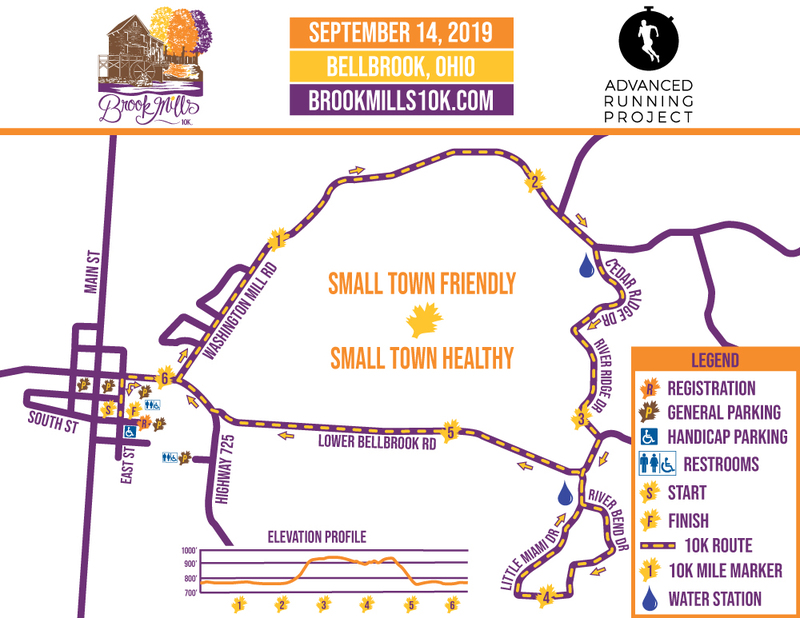 Join us for the Brook Mills 10K on September 14th in downtown Bellbrook where you will enjoy a beautiful, family friendly, fun 10K and a 1K Kids Fun Run. Portion of race entry supports the Bellbrook Sugarcreek Family Resource Center! Our races are directed by an RRCA Certified Race Director. We strive to produce professional events and act ethically and transparently as is required of all RRCA Certified Race Directors. What events will the 2019 Brook Mills 10K offer? How do I register my child for the 1K Kids Fun Run? What is the age limit on the 1K Kids Fun Run? Where do I pick up get my bib number and race packet? Do you offer discounts to runners 18 and under? The Brook Mills 10K is comprised of a 10K and a 1K Kids Fun Run. All events will take place on Saturday, September 14th, 2019. Kid’s Race – 8:00 a.m.
10K Run – 8:30 a.m.
Children can be registered online or at packet pickup on race day. While there is no firm age maximum, we generally encourage children over the age of 12 to participate in the 10K. While the Brook Mills 10K is not part of the Miami Valley Race Series in 2019, it will be in 2020. The series is currently comprised of three races including the Crossroads 5K on June 8th in Vandalia, the Historic Germantown 8K on August 3rd in Germantown, and the Gem City Classic 15K and 5K on October 12th in downtown Dayton. Runners who complete all three races in the series will earn a fourth medal that connects to the first three medals to create one beautiful award! All events are walker-friendly. With an 8:30 a.m. start, the 10K course has a maximum course time of 2 hours or until 10:30 a.m. Any runner/walker that fails to maintain the minimum pace will be asked to move onto the sidewalks to facilitate opening the roads on time. The Finish Line will officially close at 10:30 a.m. Early Packet Pickup is available at New Balance Dayton (304 East Stroop Road, Dayton, Ohio) from 4:00 – 8:00pm on September 13th. Race day Packet Pickup is located in front of the Bellbrook Sugarcreek Family Resource Center (51 S East Street, Bellbrook, Ohio) from 7:00 – 8:30 AM. Since there will only be race day packet pickup, all participants must pick up their own packet. Absolutely! One can register at Packet Pickup from 6:30 a.m. to 7:50 a.m. on Saturday the 14th of September at the Bellbrook Sugarcreek Family Resource Center. While there are no refunds, we do allow deferrals in cases of injury or emergency. Simply email info@advancedrunning.com prior to the event taking place notifying us of your intent to defer. When registration opens for the following year, you will need to email us again with a copy of the original email as proof. The Crossroads 5K has partnered with Speedy Feet, the leading event timer in southwest Ohio to provide chip timing. Runners will have a disposable timing chip on the backside of their bib and will not have to do anything in order to get 100% accurate results! On average, at 8 AM in mid-September one should expect humid conditions and a temperature in the low 60s to low 70s. However these are merely averages and weather can change any given day. We will update participants on what to expect in the 48 hour window before the race. This USATF certified 10K is scenic but does have some elevation gain, notably at the start of the third mile there is a hill that climbs 150 feet over 0.6 miles. The race begins on East St and makes its way to Washington Mill Rd where it travels north and east over the Little Miami River. It takes a turn south through a very quiet and lovely neighborhood (this is where the hill is!) and eventually emerges onto Lower Bellbrook Road where it descends 150 feet and flattens out as the route returns to the finish line. The course will be certified before the race date with a USATF Certification # added to the race website. Yes! There is a water station at 2.3M at the start of the uphill and one at 4.6M before the downhill on Lower Bellbrook Rd!! Yes! Bellbrook EMS will be onsite with trained staff to deal with any medical issues that arise during the event! The award ceremony will take place at approximately 10:00 a.m. The race has partnered with the Bellbrook Sugarcreek Family Resource Center. We donate a portion of race proceeds to their cause and encourage all runners to make donations to them both monetarily and in needed supplies.